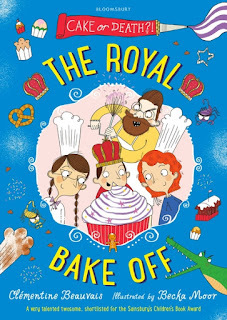 Prince Pepino’s uncle Sam, Emperor of Americanada, challenges the world to a rather unusual Bake off. Little do Molly, Anna and Pepino realise, they might not escape this adventure with their lives. King Steve, Pepino’s dad, enlists the three friends as assistants and the craziness begins. After powering their flight by running on treadmills, the children collapse exhausted in their edible accommodation. Uncle Sam cheerily explains that every cooking challenge is CAKE or DEATH. Deadly circumstances abound: the only way to get fresh eggs in the desert is by tightrope walking to a vulture’s nest; whisking egg whites requires running at top speed on a barrel at the edge of a murderous waterfall. You get the idea. With commentators on hovercrafts, a rocket ship to outer space to create in the absence of gravity and contestants who seem to be trying to kill each other, there is action on every page. Apart from all the drama, a secret lurks. Will you crack the puzzle? I didn’t have a clue. Once again, the proliferation of made-up multi syllabic words might be better enjoyed as a read-to tale but there is plenty of ridiculous enjoyment for all the family.